Camelot was fun while it lasted, but San Antonio may be just another team now. So . . . how was your Wednesday? Haha, just kidding Spurs peeps. Just thought I’d begin this with a little trademark Stampler gallows humor, on this, one of like two or three Spurs-related events that could possibly compel me to write again after my self-imposed exile/retirement. I know it was a rough one for most of you, but I hope it wasn’t too much of a shock. What may be a surprise, however, is that I’m about to do something I never thought I’d do: write the kind of new-age, new-media, namby-pamby, wishy-washy, every-one-is-awesome kind of sports column. I’m doing it of my own volition, with no prompting by anyone, because in this one case I think it’s absolutely warranted. There are no bad guys here, I’m not angry at Kawhi Leonard for wanting to leave. I’m not mad at the Spurs that it got to this point. I actually do kind of like their trade for DeMar DeRozan and Jakob Poeltl (more on that in a minute), relatively speaking. I have conflicting emotions and feelings about a number of aspects of the affair, but more than anything I am grateful for the six seasons of Leonard we got and the last quarter century of Spurs basketball in general. Is it disappointing that Leonard chose a different path than being, in all likelihood, the third-best player in franchise history when all is said and done? It goes without saying. It also stings that Danny Green, a self-made model Spur was sacrificed in the deal due to financial obligations. He’ll be dearly missed and I do hope the team does the right thing and retires his jersey one day (I think he deserves it at least as much as Avery Johnson, Sean Elliott and Bruce Bowen, to name three in the rafters). But while I’ve no doubt that Green will be cheered by the fans when the Raptors make their annual visit next year, I’ve been around enough to know that Leonard will be just as passionately booed, if not more so. And I for one will not be joining in those jeers from my couch in California. Leonard is on scholarship with me — he always will be and it is my sincere hope that the same is true for you. Thanks to him, the Spurs cheated death, at least for a few years. If not for him, the fifth championship in 2013-14 doesn’t happen. Your mileage may vary, but for me not only was that ‘chip the most fun of all, the most aesthetically pleasing of any of their title teams, but by far the best story, as well. I wouldn’t trade that year for anything. The thing to realize about Leonard’s Spurs career is that while it may seem prematurely truncated, it’s actually been twice as long and far more successful than we had any right to expect for the 15th overall pick of the draft. Here, I made a chart, comprising the 15th pick of the past 30 drafts. “Seasons” is seasons with a player’s original team (not necessarily the team that drafted them, like for example, the Pacers who selected Leonard before a draft-day swap with San Antonio for George Hill). “Ringzzz” is championships won for said team. “PER” is PER with said team. “Win Shares” is career win shares, not just with the original club, with the number in parentheses representing where they rank in their respective draft class. “WS/Year” is how many Win Shares they averaged per season over the course of their career. As you can see, there haven’t been too many 15th overall picks worth much. The three outliers are Leonard, Giannis Antetokounmpo and Steve Nash, who had two separate stints with the Suns, the second far more noteworthy than the first. A few other guys, most notably Al Jefferson and Robin Lopez, have been solid, but hardly spectacular. You see Brent Barry on here, and he remains a personal favorite (in fact, six of the top 10 Win Shares leaders of the ‘95 class have suited up for the Spurs: Michael Finley [3rd], Barry [4th], Antonio McDyess [5th], Kurt Thomas [6th], Damon Stoudamire [8th] and Theo Ratliff [10th]). But the average 15th pick has lasted all of three-and-a-half seasons with their original team, putting up a below-average 12.2 PER and accumulating about 2.2 Win Shares per season over the course of their careers. In other words, the average 15th pick has been something between Mo Harkless and Anthony Peeler. Kawhi Leonard was not that. Instead of feeling cheated or betrayed about the seasons of Leonard we’ll miss, why not be thankful for the ones we got? We’ve been so lucky about so much. The Spurs were only in position for Tim Duncan due to a freak injury to David Robinson, and even then they only had the third-best odds of landing him in the lottery. Rick Pitino pretty much took the Celtics coaching job with the assumption that he’d be coaching Duncan. The Spurs then fell into two more first ballot Hall-of-Famers in Manu Ginobili, with the 57th pick in 1999 and Tony Parker with the 28th pick of 2001. Sure, they got them because no one thought they’d be as good as they wound up being, but the Spurs didn’t either. It would’ve been preposterous to project such a future for them. Pop has said as much. And that was the case for Leonard as well. He was supposed to be Bowen with better rebounding. Instead, for a couple years any way, he basically turned into Michael Jordan. No one plans for that, and certainly not with the 15th pick. So yeah, it hurts that Leonard forced the Spurs’ hand to the point where he had to be traded. 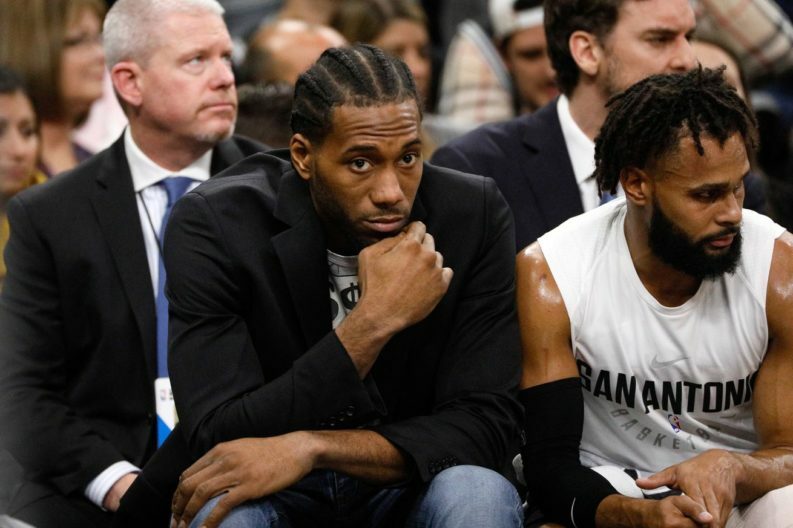 For the record, I question San Antonio’s version of the story, stated again by Gregg Popovich in his presser after the trade was made official, that the personal relationship between he and Leonard is as fine as ever in spite of everything. That makes zero sense to me. To suggest that Leonard has grievances or misgivings about the organization but not Pop himself defies logic. Pop is the Spurs and the Spurs are Pop. He controls every aspect of the franchise. In fact, Popovich has been the face of the team since Duncan’s retirement. Not Parker, not Ginobili, certainly not LaMarcus Aldridge, and not Leonard. It’s been Pop, through the sheer force of his personality (and lack of same of Leonard’s). If Leonard expressed dissatisfaction with any aspect of the organization unrelated to Pop, Popovich had the power to change it to appease him, so do the math. You can choose to believe that Pop is incapable of doing wrong if you wish, but I remember the drama with Aldridge last off-season and Jonathon Simmons —who was reportedly close with Leonard— has been sprinkling hints on social media that all was not hunky dory as well. Ultimately it just doesn’t matter. Maybe one day Leonard will tell his side of the story or someone with the Spurs will speak out and offer us a nugget or two. What will it change though? Leonard felt what he felt, and who are we to tell him he’s wrong? If anything, the trade makes official the end of an era and signals that it’s time for Spurs fans to wake up for good after having hit the snooze alarm the past three years since Duncan hung ‘em up. Tim’s unique greatness and leadership covered up a lot of ills that every professional sports franchise goes through. Stuff happens behind the scenes with fame and money and egos and a bunch of alpha males. The Spurs were no different. Duncan made Camelot possible, or at least the illusion of it. Now, with not only Leonard gone but also Parker and most likely Ginobili, we get to see the Spurs exist as just another team. And that’s fine! They’re still in better shape —and considerably smarter— than most of their peers. Aldridge has a couple years left as a star. DeRozan is a top-20 talent, and coincidentally enough, probably the closest modern equivalent to Spurs legend George Gervin as far as his game goes. I’m a lot happier they got him and Poeltl than the assorted flotsam the Lakers were offering. Actually, let’s talk about the basketball part of this for a second, the trade-that-wasn’t with Leonard’s desired franchise. I still can’t believe the Lakers didn’t offer whatever it took to land Leonard. This is KAWHI FREAKING LEONARD. If the Spurs ask for the purple in the purple-and-gold, you say, “I guess we’ll just be gold.” If the Spurs ask for Magic Johnson, you say, “we’ll have Kobe be our figurehead GM.” Leonard, when healthy, is one of the top three players on the planet and you just signed one of the others in LeBron James, who’s about to turn 34. That combination gives you a realistic chance of toppling the Warriors. You’re the one team Leonard’s camp has expressed a desire to play for, meaning that you’re the one team that would be a betting favorite to secure the all-important contract extension with him instead of being a one-year rental like Toronto. How long do you think LeBron will keep playing at an otherworldly level? Instead of putting the terrifying tandem of James and Leonard out there you want to goof around with the Spurs over Brandon Ingram and Jason Hart? You don’t want to trade a quarter to the San Antonio dollar because you’re worried your quarter is too shiny and your nickel might turn into a dime some day? Are you kidding me, Lakers? This is indisputable proof that James just went there because he’s given up chasing the Dubs and just wants to be a movie star and entertainment mogul in his NBA golden years. The signings they made after James would get you laughed out of your fantasy league. The Lakers have been a laughingstock for years and will continue to be, as long as they’re run in this fashion. “Oh no, we can’t give up on Ingram. He might be the next KD.” DUDE’S PUT UP AN 11.0 PER AND 2.5 WIN SHARES IN TWO SEASONS. You know who’s second in Win Shares for the 2016 draft class? Poeltl, that’s who, with 7.2, only behind Ben Simmons. Dejounte Murray, for what it’s worth, is tenth at 3.2. Parker had a 12.7 PER and 1.7 Win Shares last season and if he was any more washed he’d BE Jordan instead of merely playing for him. Ginobili put up a 12.9 PER and 2.2 Win Shares last year and he’s literally older than me. Durant put up a 20.8 PER and 7.9 Win Shares in his second season (also his age 20 season, the same as Ingram.) Meanwhile, Leonard had a 16.6 PER, 6.2 Win Shares and was shutting down James during the 2012-13 Finals in his second campaign. In the NBA you find this stuff out pretty early. A guy either has the dog in him or he doesn’t. Ingram doesn’t. Don’t ever change, Lakers. You did the Spurs a favor. It’s also possible that we’ve also already seen the best of Leonard. For all his greatness, durability has not been his strong suit, even before last year. His draft class is fascinating. Would you believe he ranks 20th among that group in games played? Sure, you might guess a couple of names like Klay Thompson and Kemba Walker, but what about Kyrie Irving, not exactly known for his availability. What about Tristan Thompson or Bismack Biyombo or both of the Morrii? Isaiah Thomas? Enes Kanter? E’Twaun Moore? Cory Joseph, who rode the Austin-San Antonio shuttle his first two seasons? More career games played than Kawhi Leonard. Derrick Williams, who was a complete bust as the second overall pick? More games played than Kawhi Leonard. Chandler Parsons has been in traction for the last three years, and he’s somehow played more games than Kawhi Leonard. Leonard also ranks 11th in his class in minutes played, again behind the Ironman that is Chandler Parsons. You want to win a free beer? Bet a friend who’s scored more career points, Leonard or Tobias Harris. And he has a degenerative muscle issue. It’s not going to magically go away. Like LeBron, Leonard is on borrowed time here. Neither of them will hold up to the standard they’re accustomed to for much longer and the Lakers should’ve gotten him while the getting was good. As for the Spurs, they’ll be alright. They’ll make the playoffs like they always do. They won’t be a threat to the Warriors but who is, really? In the end this is a story about a disgruntled athlete wanting a new zip code. It’s hard for me to be worked up much over it, given the particulars. I’m too thankful to Leonard for what he’s provided already and too resigned to the Warriors’ dominance to regret what could’ve been. Besides (with the world as it is) is it even possible to care that much about something so trivial? Maybe your answer is that it is. It certainly was for me for a very long time. But even if your argument is that sports serve as an escape from reality, you have to realize that Leonard is entitled an escape too, and he’s every bit as worthy of it as you are, to a life and a career on his terms. The Spurs did as well as they could’ve been expected to in moving on — and far better than we’ve had any reason to expect when Leonard arrived. That’s enough for me.